An All-In-One PC/Internet Activity Surveillance and Monitor. 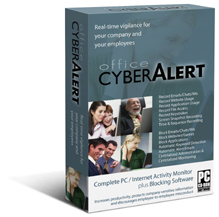 Automatically Record, Archive and Review Your Employees’ PC and Internet Activity. With more employees using computers in the workplace than ever before, the enticement to use the Internet for personal reasons is causing real concerns for their employers...concerns like loss of productivity, legal liability of employee misconduct, and theft of corporate intellectual property.